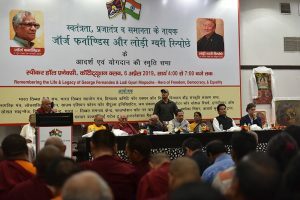 New Delhi: A Memorial program “Remembering the Life & Legacy of George Fernandes and Lodi Gyari Rinpoche-Hero of Freedom, Democracy & Equality” was held at Speaker Hall Annexe, Constitution Club, New Delhi in the evening of 6 April 2019. Deputy Speaker Acharya Yeshi Phuntsok addresses the memorial program by thanking the organizers of the program on behalf of Tibetan Parliament-in-Exile (TPiE) and all the Tibetans. He also spoke about the official obituary references paid to late George Fernandes and late Gyari Lodi Gyaltsen in the budget session of Tibetan Parliament-in-Exile for the fiscal year 2019-2020. Late George Fernandes and late Gyari Lodi Gyaltsen have worked throughout their life for the cause of Tibet. 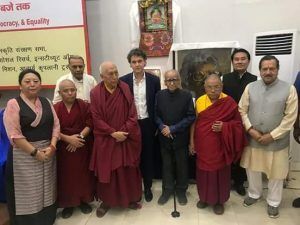 Initiated by Gyari Rinpoche, Late George Fernandes who was a staunch supporter of Tibet along with other Members of All Party Indian Parliamentary Forum for Tibet (APIPFT) were invited to Dharamsala in 1990. Similarly, he attended the 48th Anniversary of the Tibetan National Uprising Day on 10th March 2007 with other Members of All Party Indian Parliamentary Forum for Tibet (APIPFT) and also initiated the First World Parliamentarians’ Convention on Tibet in 1994 in New Delhi along with the other Members of Indian Parliament. In 2008, even in his poor health condition, he along with Smt. Jaya Jaitley, many Tibet supporters and Tibetans participated in a protest against 2008 Beijing Olympic organized by Kashag and Tibetan Parliament-in-Exile from Rajghat to Jantar Mantar. Deputy Speaker urged admirers of Late George Fernandes, who are also Members of Parliament to continue their support for Tibet. He further spoke about late Gyari Rinpoche, who has worked in Tibetan Freedom Press, Voice of Tibet, Tibetan Review, etc., as an editor and Journalist. Gyari Rinpoche has worked in Central Tibetan Administration and was also elected as a speaker of Tibetan Parliament-in-Exile. He has served as a special envoy of His Holiness the 14th Dalai Lama to the United States. The conference of National Endowment for Democracy held in Delhi in 1997 was attended by many Tibetans because of the grace of Carl Gershman (President of National Endowment for Democracy), late George Fernandes and late Gyari Rinpoche. So, Finally Deputy Speaker spoke about the current critical situation inside Tibet. 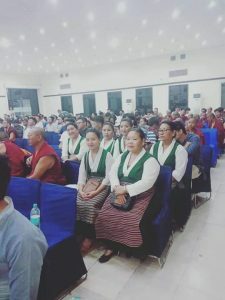 He also thanked all the attendees and the organizer for the memorial program, urge all to continue supporting Tibet and distributed handbooks entitled ‘’Self immolations inside Tibet’’ and ‘’Appeal for Tibet to the Indian Parliament and State legislatures’’ published by Tibetan Parliament-in-Exile. The program was graced by host of dignitaries namely Honourable T. N. Chaturvedi, Former Governor of Karnataka, His Eminence Prof. Samdhong Rinpoche, Former Kalon Tripa, CTA, Choekyong Wangchuk, Health Kalon, CTA, Shri Indresh Kumar, RSS Pracharak, Mr. Matteo Mecacci, ICT President, Smt. 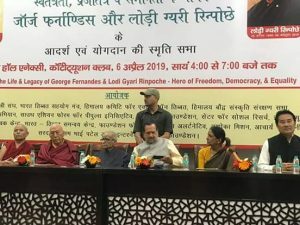 Jaya Jaitley, Indian politician, Lama Lobsang, Dr. Anand Kumar, Dolma Gyari, former Minister of Department of Home (CTA), Lama Choesphel, Dr. Nanoj Kumar and others. Kasur Ngodup Dongchung, Representative, Bureau of His Holiness the Dalai Lama, New Delhi read out the message of His Holiness the Dalai Lama. The program was held from 4 pm to 7:30 pm.